The footage was recorded in 2000. 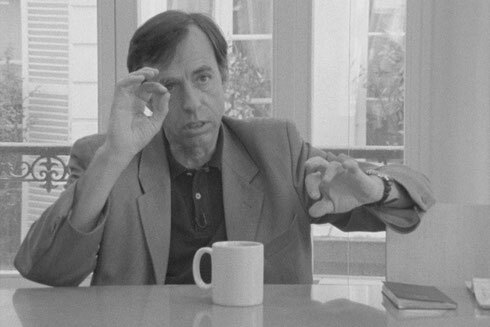 It is a long interview with the economist and journalist Bernard Maris (famous for his sharp and profound criticism of Neo-liberalism) at the editorial office of Charlie Hebdo, 15 years before his assassination on January 7, 2015. Maris was one of many victims during the attack of the terror organization Islamic State. The first thing which comes to my mind is the memory in Brouillette´s masterpiece L´Éncerclement from 2008, probably the most comprehensive film essay on Neo-liberalism in the history of cinema. Like Oncle Bernard..., L´Encerclement does not only reveal what the protagonist are thinking, we literally see them thinking. Even though we see in both films almost nothing than talking people, both films offer a brilliant balance between a nearly minimalistic approach of film and at the same time a stirring intensity. 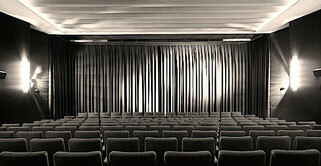 Recorded in Black and White on a 16 mm-camera, the film is always interrupted by reel changes, the recorded sound continues while the screen remains black for a short while. It is noisy in the editorial office of Charlie Hebdo which sometimes distract the film team and Maris but for the audience it is almost a more intense experience. Different than in L´Encerclement, Oncle Bernard... seems more like a memory, a legacy and finally a homage to Maris. The shadow of Maris´assassination is to big to ignore it. The fatal ideology and the consequences of the Neo-liberal policies on each aspect of public and social life in nearly all contemporary societies is explained by Maris in an impressive clarity of thought: From the privatizations of state owned enterprises like Post, public transport or health care and from the shady policies of the capital economics. But the neo-liberal virus goes even further. The freedom of press the so-called information society is (very few marginal exceptions included) more or less just a part of the ideology of the economic power. The statements of Maris are traceable and we do not have to dig very deeply in our every day experiences. And it does not mind in which part of the world we live in. I myself have still in my memory the last strike of the post worker in Germany, the French worker will face just now the most aggressive attacks on worker rights in France after World War 2 like the Germans did with the so-called Agenda 2010. Both attacks are organized by so-called socialistic or social democratic governments which are following the ruling ideology of Neo-Liberalism. Like L´Encerclement, Oncle Bernard... is as disturbing like a dystopic science fiction or horror film but the night mare is too real and one can not escape it. A film is not always just what it is but as well what it evokes. No wonder that this minimalistic approach of Brouillette´s two last films has nevertheless this intensity which is hard to describe. When Maris talks, in this film we do not only understand what he says but we got as well an idea how. There is often an anger in his voice and in his gestures. And yes the face of Bernard Maris is burnt into my memory. That is what I would call “Cinéma pur." Richard Brouillette made both, a political essay film but at the same time he draws a portrait of Bernard Maris. What this film distinguishes from L´Encirclement is that Oncle Bernard... evokes in me more the character of the memory of an encounter. The interruptions always when the film reels had to be changed, these short moments of darkness even when the soundtrack continues gives the film (originally recorded on 16 millimeter) the fragile character of a human memory which works organic. There is one small beautiful moment when Maris talks with his colleague Jean Cabut, another one among the 12 victims of the terror attack in 2015. A small confidential every day talk of people who know each other for a long time and the power of it´s collision with my knowledge of their assassination 15 years after these images were recorded is nearly unbearable for me. Oncle Bernard – L’anti-leçon d’économie by Richard Brouillette is like L´Encerclement both: a sharp political essay film but as well pure cinema – and even more important – it is authentic to the bones.